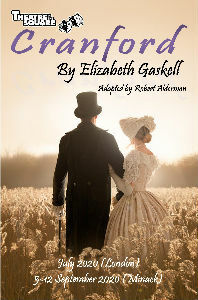 Robert Alderman is writing and directing an original adaptation of Elizabeth Gaskell's Cranford, which will be performed in London in July 2020 and at the stunning Minack Theatre, on the cliffs at Porthcurno, Penzance in Cornwall. In Cranford the idiosyncratic but endearing ladies hope to preserve their gentility, lifestyle and social customs from change. They combat the changing world around them. Chief among the setters of norms and customs are the Jenkyns sisters, Miss Deborah and Miss Matty, who are challenged when Captain Brown comes to town with his more worldly approach to life. At the same time Dr Frank Harrison arrives to assist Dr Hoggins but ends up opposing the older doctor who is set in his ways. The unmarried ladies of the town vie for his affections but his heart is set on Sophy Hutton, the vicar's daughter. The tranquillity of the town is disturbed by tragedy, blooming romance and comic mishaps. With a cast of characters of 25+ (there will be some doubling of parts), there are plenty of opportunities for performers of all ages. We will need dedicated, reliable and enthusiastic participants who will attend all rehearsals and commit to both performances. Auditions are a year ahead of the performances to allow those cast to make arrangements for accommodation in Cornwall. Contact Robert with any questions info@theatreinthesquare.org.